Yesterday was a rain event for the island on and off most of the day. We received .87" the last time we looked. It seems there is a tropical wave east of the islands but according to the NWS in San Juan this is the forecast for the next few days for Vieques. ELEVATIONS. EAST WINDS 10 TO 15 MPH. CHANCE OF RAIN 50 PERCENT. .TONIGHT...PARTLY CLOUDY. ISOLATED SHOWERS EARLY IN THE EVENING. SCATTERED SHOWERS AND ISOLATED THUNDERSTORMS AFTER MIDNIGHT. BREEZY. ELEVATIONS. EAST WINDS 10 TO 15 MPH. CHANCE OF RAIN 70 PERCENT. THUNDERSTORMS. BREEZY. SOME THUNDERSTORMS MAY PRODUCE GUSTY WINDS. RANGING TO 84 HIGHER ELEVATIONS. SOUTHEAST WINDS 15 TO 25 MPH. RANGING TO 76 HIGHER ELEVATIONS. For some reason the NWS does not predict the rain possibilities for Vieques Tuesday night to Wednesday night. I am not sure why. My gut feeling is that the wave will head north of us and we will get some locally heavy rain but not much to write home about. For us in Vieques we can expect winds around tropical storm force starting tomorrow and expect a update from a watch to a warning by early in the morning. Today has been averaging around 90 with intermittent breezes. It has been suggested and I will pass on that anyone living on the island should take some time tonight if you have not already done so to batten the hatches and make sure that any object that may be able to fly be put away. That being said my husband Lee and I were informed a few hours ago that his son-in-law has passed away. We are still chatting with airlines, we may be able to get out tomorrow so if you do not hear from us, now you may know why. All of you in the Carib are in our minds and hearts. - Does anyone out here Tango? I have to say through all of my years of sailing and watching the weather this is the worst NHC forecast I have seen. In the last 3 days we have seen so many different tracks that no one in their right mind would pay attention to. Today was another scorcher, 90.4 for the high. We did at a few times have a light breeze and while going downtown this morning the sea looked as if you could skate on it. The stores were almost empty at about 11 am. This surprised us since we thought we would see more out and about shopping for last minute items so they would not be caught in the lines at the last minute. We managed to complete our hurricane list and the gas station only had a few cars so we topped off our car (about 2 gals). While at Florida Hardware (pronounced Flor-ee-da) to pick up some last minute items such as tarps etc, we noticed they had stacked pallets of dog and cat food as a reminder to remember our pets during storms. Many do but some get in a hurry and at the last minute there may be none available. So please make sure your hurricane supply list includes the #1 item of at least a week or two for your loved ones. Also while there we chatted with the owner about the island procedures. While we do have a emergency plan apparently it is never followed through. One thing we can count on he said is that when a storm approaches that the PR Power Company will cut the power as a precaution because we still have many wooden poles. That he says depends on the winds and there is no written rule when that will happen, wind speed, etc.. So be prepared for anytime prior to a storm arrival that your power may go off. He also cautioned us to say that if there were poles down expect at least a 4 day wait for PR Power to come over because their first priority will be the big island. I also called a ferry capt this morning that I know and asked her about the ferry service. She said that the capts are at their own discretion as to when to stop running the boats. If the capt feels it is too uncomfortable for the passengers or the safety of the boat, it stays at the dock. In the event a hurricane is expected, the day before landfall all ferries are taken to San Juan for safe harbor which allows the capt and crew to return safely home prior to the hurricane striking. All of that said and done TS Dean has been dancing around so much I do not know what to expect. One minute it is to the south, then to the north. Then you wake up and it is projected right over us as a hurricane. Them 6 hours later it is south again. But wait.....another model has it back on top of Vieques again. I have decided to wait until thursday to see what the 3 day cone shows. Not that I recommend any of you to do the same since I am done with my shopping etc. I am just tired of the dancing and it is still days away. It is time for us to all band together. We may need each other in the coming weeks. Today has been so hot I even feel sorry for the horses, ticks and all. Our high was 91.4 with virtually no wind to speak of. What we should speak of though is TD #4. The NHC has the newest cones taking a more northerly turn than they did this morning but many weather professionals still think this will be a caribbean storm. My suggestion is to start making lists, do your shopping, get gas, check your generators, etc. and pray the NHC is correct. Just be cautious, we are definitely not in the clear yet, it is to far away. This post was for today so it should have started with "This morning...". Yesterday in a 10 minute downpour we managed to receive .35" of rain. Our radar shows mostly pop ups and we seem to be in the clear for a short while. The good news is that we can see Puerto Rico today so the african dust is down. The Puerto Rican 5 day holiday is over but town this afternoon was jammed packed. For some reason this summer we have seen over double, maybe triple the number of tourist than we normally would see at this time. I did hear that "Islands" magazine in its July/August issue lists the top 20 islands to live on in the world and Vieques is on the list but I have not seen a copy yet. Could this be why we have so many tourists? It is anyone's guess. The rain certainly help with our gardens which total about 1 acre. 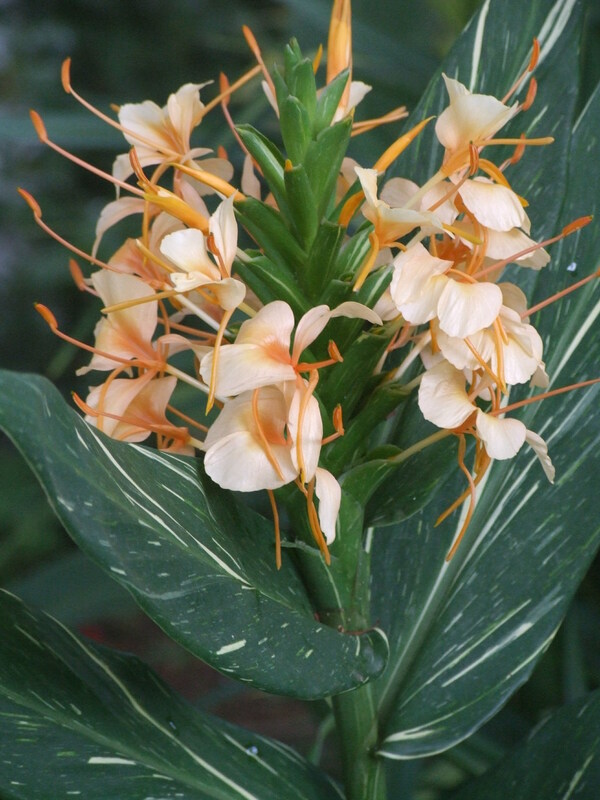 Attached is my first flower from a variegated ginger "Dr. Moy" that I planted about 16 months ago. For all of you lower islands, keep your umbrellas handy and stay dry. You may have some weather in the next few days. So far we have received .24 of rain today but expect much more since we have a 60-70% of rain through tomorrow night. You may also go to our live weather station at www.playacofi.com/weather for updates. When I asked for then rain dance the other day I never thought that so many of you would have shaken your hips and other body parts! In the past few days we have had impressive rain and today so far we have had 1.34" along with enough sun to get in the pool and enjoy the moment. We have had no winds to speak of so our plants have done well and are well rooted for this amount of rain in a short period of time. On the flip side, a bit of Vieques news. We had a helicopter drop down at the heliport last sunday night at about 200' that caused considerable damage and they had to send another helicopter over. But.....Due to visibilty they could not pick the patient up and returned to Fajardo. Well, let me tell you how close they were. They were hovering over our house so low that it was whOOOOping and the house was shaking. Maybe about 50'. If they had gone another 1/16th of a mile they would have found the heliport....But no, they turn around. Weather was perfect, no clouds at that time. Visability???? hmmmm. Maybe veteran pilots enjoying the holidays and newbies flying in on a range line and lost? The Fajardo II our ferry that carries 500 passengers lost steering saturday arriving in Fajardo and hit a partially submerged vessel in Fajardo so it is out of commision. Along with the Culebra ferry so we at **** out of luck for a comfortable ride to the big island. Numerous other news, to many to mention. My computer did a swan dive on me so I no longer have my email addresses I once did to update interested folks. Email me at knotimpaired at earthlink.net and I will try to get everyone up to speed. 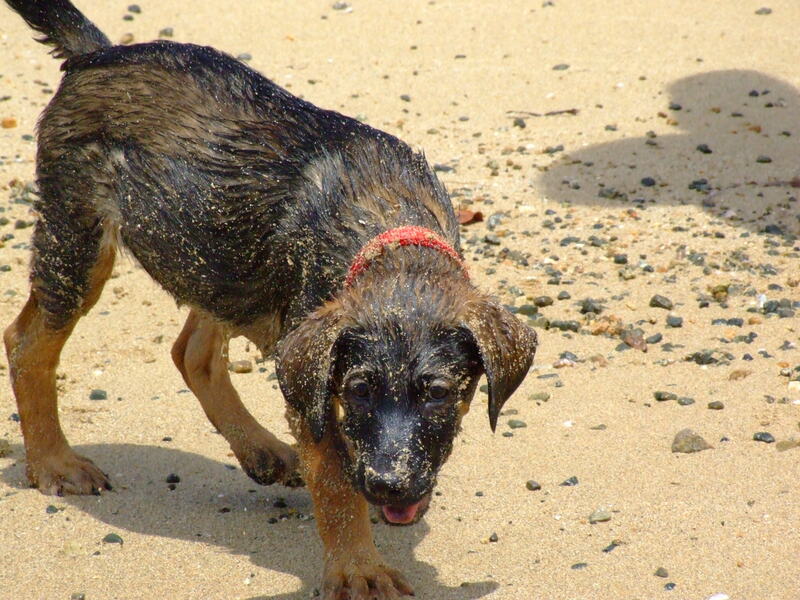 Coqui Perro who I introduced to everyone here early April went to her first beach day and she had a blast. When we received her April 2nd she was 1 lb, 10. oz. Today she is 15 lbs. Enjoy the calm while you can and remember we will all stand together in times of need as we did for Grenada. Yesterday we managed to squeeze in about .10th of an inch of rain. Just enough so we did not have to water the gardens. Hope all is well with everyone and someone PLEASE do a rain dance!! !